with Romy - The Energy Queen! Join Romy, the Energy Queen, for a two-hour workshop that will introduce you to powerful tools to manage your energy and enable you to have more conscious interactions and relationships. Bring a friend, coworker or family member to this free workshop, and experience first-hand how a common language can help you emerge as the leader you are meant to be. Change the culture of your relationships and start applying these easy tools immediately to create SHIFTS in your life. REGISTRATION REQUIRED! How do we use our thoughts for positive change in our bodies, hearts, and lives? We harness the power of Prana, our life force. Prana moves in five directions, called the Vayus, and influences our physical body and mental thoughts in different ways depending on the direction it is moving. The breath and the exercise of it called Pranayama, helps with the movement of Prana along with asana and other yogic tools. Ultimately, once we can put our full concentration on Prana, we learn to harness the power of the universe inside of us. This immersion will focus on one Vayu each day. Combined with dynamic movement and potent breath work you will leave feeling not just energized, but Pranacised! Monday, May 6 - Friday - May 10 . Yoga Nidra, at it’s most superficial, is a deeply relaxing technique that can reduce stress and improve sleep. It’s deepest intentions are to heal, to expand our awareness, to clear our perception, and to access the higher levels of our mind. Yoga Nidra is a guided meditation-like practice done lying down in a comfortable position. It is an ancient practice that is accessible to everyone. Beth Ando-Brenman is a 500-hour registered yoga teacher and a licensed physical therapist specializing in vertigo and balance disorders. She enjoys creatively blending both practices, whether teaching yoga or physical therapy! Join Beth for this informative workshop and come heal your body! Bring a friend, coworker or family member to this free workshop, and experience first-hand how a common language can help you emerge as the leader you are meant to be. Change the culture of your relationships and start applying these easy tools immediately to create SHIFTS in your life. This class is designed for those who want and need to fill themselves back up. Life on the outside can be pretty stress-filled these days. Restorative Yoga helps you remember how to find the calm in the storm, find strength from within and revitalize yourself so that you feel whole again. For the Yin portion of the class, we will hold postures for longer to allow a stretch of the connective tissue, increasing range of motion over time. Come enjoy this restful yoga practice to help bring balance and peace back into your life again. The Sanskrit word bhakti comes from the root bhaj, which means "to adore or worship God." Bhakti yoga has been called "love for love's sake" and "union through love and devotion." Deepen your yoga path with 6 Days of Bhakti Yoga! What are you devoted to? How does your yoga practice influence or affect your daily life? In this intensive, we will practice mantra, chant, breathe, sweat, and meditate daily as we explore our commitments and effect our path of devotion. Registration required: Need 10 Registrants to hold workshop. Come join Gina for a 30-minute , healing crystal singing bowl meditation. We harness the power of Prana, our life force. Prana moves in five directions, called the Vayus, and influences our physical body and mental thoughts in different ways depending on the direction it is moving. The breath, and the exercise of it called Pranayama, helps with the movement of Prana along with asana and other yogic tools. Ultimately, once we can put our full concentration on Prana, we learn to harness the power of the universe inside of us. Yoga & Hiking Weekend Retreat! 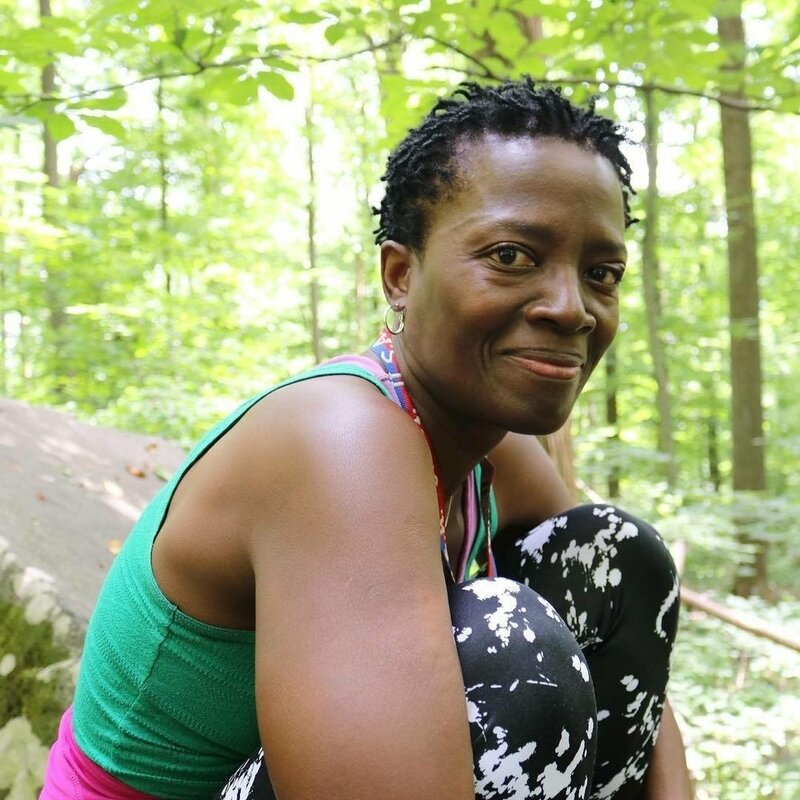 Mohican Outdoor Center, Blairstown N.J.
Bring your mother, sister, friend to this lovely low-key all- women of Color retreat. Come enjoy quality time at Mohican Outdoor Center in the beauty of Fall! Come enjoy a safe space to hike and experience the outdoors with other like-minded women. Let go, de-stress and recharge. This wonderful weekend retreat offers many opportunities for activity and play, as well as time to rest, renew, unwind, unplug and reflect. Lots of time to play games, hang out, relax, read and connect with yourself and others. Friday Oct. 19- Optional Hike - Gentle Yoga & Dinner- Activity - Arrive any time after 1pm. Sunday Oct. 21 - Meditation, Yoga, Breakfast & Optional Short Hike, Other Activities & Departure. Weekend includes: Dinner on Friday. Breakfast, Lunch & Dinner on Saturday, Breakfast on Sunday. Accommodations; large warm heated cabin, with clean indoor bathrooms; bunk rooms that sleep 2 or 3 people. Mattress and pillows provided. Bring your sheets or sleep sack or sleeping bag! 2 Triples & 5 Doubles Available: Be the first to reserve your space! Investment: $290 before Sept 1. $320 after Sept.1, if space available. Fall, or harvest time, makes for a natural New Year! Join Romy for one week of Yoga and conscious leadership tools as you focus on your time, energy, and how you have been arranging yourself in 2018 so you can have more power. Are you feeling the way you wanted to feel in 2018? Get ready for a big Finish! Come breathe, chant, meditate, sweat and begin again! Registration Required: $100 Register by September 25. If you have never tried yoga this series is perfect for you, and is designed to meet the needs of those new to yoga as well as those seeking continued understanding of basic yoga poses. 4 classes meet on Thursdays, Sept. 6, 13, 20 and 27. As we get older, our bodies become less mobile, less healthy and less pain-free. Many of us are sedentary most of the day, or have consistent movement patterns such as frequent running or cycling, playing a certain sport for years, or have compensating patterns for old sports and other injuries. Kaiut Yoga is about biomechanical health - your freedom of movement. It has been designed to work through chronic pain & injuries, general aches & stiffness, and work for the inflexible, the hyper flexible and the ageing body. Unlike most yoga that stretches muscles, Kaiut Yoga works from the joints. It’s about maintaining or returning the body to optimal structure and functionality, freedom of movement, physical system and energy flow. It’s about keeping us as healthy, mobile and pain free as possible for as long as possible. With more freedom of body comes freedom of mind. It’s about a better quality of life. Come to this introduction to Kaiut yoga and see! This is low impact yoga for every body. Honoring the Sun is one of the oldest forms of the Yoga practice. The Gayatri Mantra, a verse from the oldest yogic text, tells us that we are children of the Sun and are made of light. In this modern day version we will practice 4 rounds of 27 salutes to the sun, alternating between flowing Surya namaskar A’s and chanting the Gayatri Mantra. Pranayama and meditation will complete the practice. Join Romy and the Gitanjali band for a special evening of Restorative Yoga and Music. We will create space and ease in the body with long-held floor postures that relax the muscles and target the deep connective tissues of the hips, while listening to the beautiful sounds and mantras of Gitanjali. Join in the chanting or just take in the sound of mantra and prepare to deepen your self-awareness and meditate. Come away feeling relaxed, rejuvenated and restored, with your hips and heart wide-open. All levels welcome! What are the nature and benefits of Kirtan/Chanting? The ancient language of Sanskrit is a vibrational language revealed to the Masters who sat in deep meditation and heard the vibrational sounds of the Sanskrit alphabet moving through the psychic energy channels in the body. Gitanjali offers Kirtan for the upliftment of society and connection to Universal Self. Their music is considered Bhakti yoga, an expression of the Divine Love and Union, which permeates all things..
he 4-week series is great for those who have a practice and for beginners alike! Julia has taken the traditional sun salutation practice to a whole new level. Join us for the ultimate mind and body celebration to welcome Summer. Four sets of 27 salutations will alternate between asana (Surya Namaskar A) and mantra (Surya Gayatri). A special meditation will close this modern-day ritual practice.